Update: Yes, there are still some patterns left! Go to this post and follow the instructions. I'll remove the links once the patterns are sold out. Cheers! Hey, it sounds like your patterns have started arriving in the mail! I finished making this one a few weeks ago and have been enjoying it. I particularly like wearing it as a backpakc and having my hands free to carry Ms. Tsia when we ride the subway or when she insists she needs to be UP. She went with me to pick up more hardware for the patterns today and enjoyed herself so much that when we left she insisted we stop at more stores as well. My kind of girl! We managed to run another errand and stop at The City Bakery for a pastry on the way home, which is way more than I can usually expect from a morning out with the kiddo. This week we're celebrating a mini-vacation at our house; Todd starts a new job next Monday, so he's enjoying a little break beforehand. I'm spending a little time with him as well as catching up on some neglected items on my To Do list. And we'll be visiting some friends in New Jersey later in the week. But mostly I'm working on a secret project. So no, I haven't disappeared from the blog. At least permanently, anyway. I'll be back as often as I can for a while. And I'll spill the beans on the secret soon, too. Stay tuned. The embroidery turned out ok, didn't it? It helped when I was teaching the class and giving demonstrations because otherwise the printed lining with a plain exterior made it difficult for everyone to remember which fabric was the outside and which was the inside. I can't decide if it verges on hippie, though. Certainly, if I had added macrame straps there would be no question. I did get my pattern!! Thanks! It is so nicely done. I will report back once I have actually been able to find some sewing time! are you kidding me??? i thought this was the pattern on the fabric, i cant believe this is embroidered. awesome job! Saying the embroidery turned out ok is such an understatment! It looks amazing! I received my pattern and was so impressed with all the packaging and attention to detail. Now that I see this lovely new rendition in linen I may never get that bag made for want of choosing the perfect fabric. I should just dive in and make several! 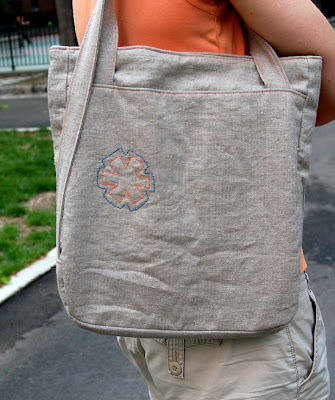 The embroidered linen bag is a stunner. I got my pattern and was so impressed by how professional it is. It looks great!! I just have to choose my fabric now... your embroidery looks wonderful. I thought it was pre-embroidered fabric until you mentioned that. And I love secret projects, I have a couple going on now too! Ooh I love it! 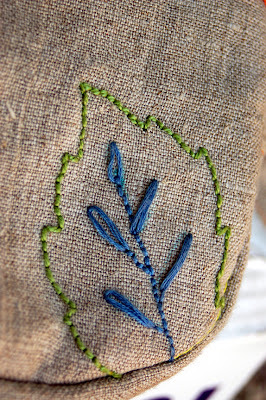 Love the embroidery! Now I want a pattern! The embroidery turned out way better than OK--it's gorgeous! What a great bag! My package arrived as well -- hooray. 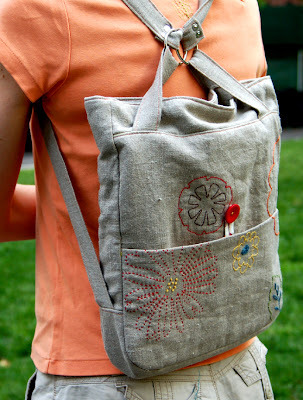 Your embroidery is lovely and I really like the way the interior and exterior echo each other. Very clever. Thank you! As always, you provide inspiration. Love the lining fabric! Very cool bag. I'm wondering if there are any patterns left?? I bet you are writing a book. If so congratulations. I think this is so beautiful! (I second the commenter who thought the fabric was printed). 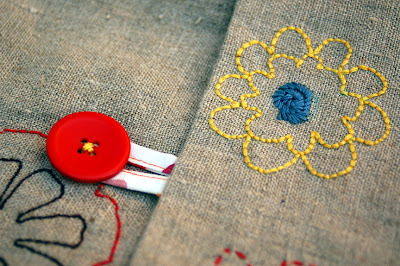 Your pattern-making and embroidery are very inspiring. I was thrilled to get mine! It was addressed to my husband since his name is on the paypal I used, but when I saw the sewing machine logo, I knew it was for me! I grabbed it with glee and he was quite disgruntled until I explained. i'm a wee bit confused. are the patterns all sold now? I didn't see any link, but the update saying there were still some available, well, says there are still some available. Oooh, I want one! So what if it borders on hippie... no macrame here! LOVELY!!! 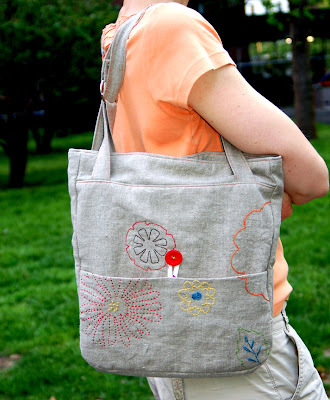 wowee - this bag is fabulous. i love everything about it! 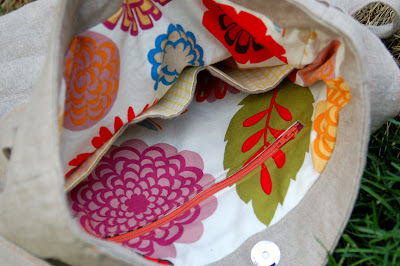 Can you tell me more about the fabric on the inside of this bag?? I would love some of it! Sure! It's Alexander Henry's "pink zinnia." Purlsoho.com had it; it's a recent fabric, and you should still be able to find it someplace. Cheers! Oh my, that bag is perfect, I love it! Liesl, your stuff just gets better and better.